Athens, Greece – Heavy clashes occurred on Thursday, December 6, 2018 between thousands of police and black-clad protesters on the 10-year anniversary of 15-year-old Alexis Grigoropoulos being killed by Greek police in Exarcheia. Greek riot police used many crowd control devices against the crowd, including water cannons, hundreds of tear gas canisters, and grenades, with some officers even throwing rocks at protesters. Ultimately, police sent at least three protesters to the hospital and injured dozens. The aggressive crowd lobbed massive amounts of molotov cocktails and other incendiary projectiles from the streets, and even from rooftops, as pitched battles stretched late into the evening. 66 were detained, 13 were arrested. Demonstrations of the day began with a student action around noon near the University of Athens in the chilly rain. Minor clashes broke out at the demo began. After rocks and tear gas were exchanged between student protesters and the riot police, around a thousand people marched together past Syntagma Square and by the Parliament building which was guarded by hundreds of riot police. The march dispersed without incident, and a group of people went over to the vigil site for Alexis. As night fell and thousands gathered for an evening demo, barricades were erected on dozens of streets throughout the storied anarchist neighborhood of Exarcheia in efforts to ward off attempted police incursions into the district. 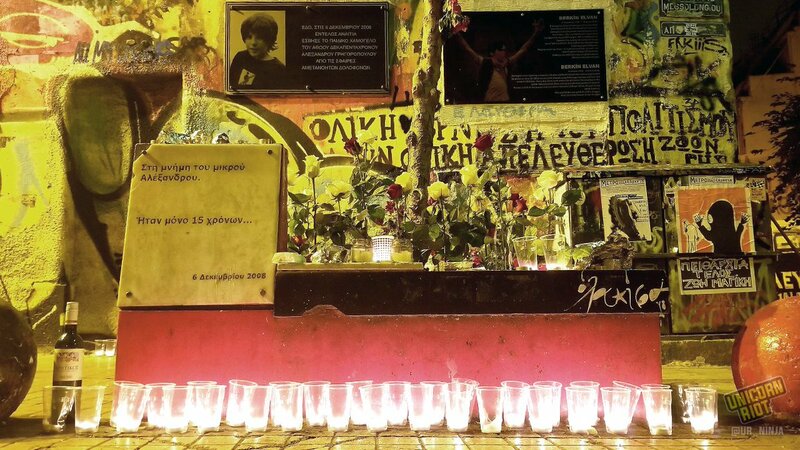 Ten years ago, on the night of December 6, 2008, Alexis Grigoropoulos was on Tzavella Street in Exarcheia with his friends when Epaminondas Korkoneas, a special guard member of the Greek police, shot Alexis in the heart, killing him instantly. Korkoneas was found guilty of culpable homicide and was given a life sentence for Alexis’ murder in his first trial. He has since appealed the decision. Korkoneas’ parter, Vasilis Saraliotis, was found guilty as an accomplice and received a 10-year sentence. Korkoneas has appealed the decision and will be tried by the courts again in the future. This year, in a familiar yet unchoreographed December 6 tradition, demonstrations during the day were followed by battles that raged throughout the night between thousands of black-clad and hordes of Greek police. Around 8 p.m. a raucous crowd upturned a car and set it afire at a Stournari Street barricade next to the Polytechnic University. Greek riot police used multiple water cannons throughout the night against the protesters, and were observed consistently throwing rocks at the crowds while helicopters and drones rotated overhead. Fireworks and molotovs rained down on police and their water cannons when they raided certain streets, as groups of militant protesters controlled numerous rooftops inside Exarcheia. More raw footage from #Exarcheia earlier tonight in #Athens, #Greece shows molotov cocktails and fireworks raining down from a rooftop onto a police position that included a water cannon. Greek riot police forced their way into Exarcheia Square at least twice, shooting tear gas and beating people as they scattered down other streets. Police seemed to purposefully aim and fire many of their grenades and tear gas projectiles directly at eye level. It’s unclear exactly how many injuries were sustained by the crowd, but there were certainly dozens, mainly from the crowd control incendiaries being thrown by riot police. Our reporters witnessed one person being taken away in a stretcher, two people being carried away, and numerous other injuries. Witnesses said that one person was medically treated by doctors at Notara 26, the refugee and migrant squat, before being taken to Evangelismos Athens General Hospital. Three people were officially reported to have gone to the hospital. Greek riot police were filmed throwing tear gas into a building’s lobby and immediately attacking those who ran out. They were also seen punching people in the face and kicking a person while they were on the ground after they’d been punched in the face. The police left the person they punched laying there, seemingly unconscious. Journalists also filmed police hitting a protester in the face with a riot shield while he was handcuffed and standing idly after being detained during a police incursion down one of the streets.